We are back in Albany, NY after nearly a year in Asia. We just found a beautiful apartment in a great neighborhood. Some of our new neighbors happen to be refugees. Many of them are ethnic Karen from the Thailand-Burma border where we spent three months in the spring working on Unseen Mae La. Last weekend there was a wonderful article in the Times Union about the neighborhood and the refugees who live there. We've been sorting through photographs...thousands and thousands of images from the last year. This is one of my favorites. I took it at the Golden Temple of Amritsar in India. The Golden Temple is the spiritual and cultural center of the Sikh religion. It is their most important pilgrimage site and is frequently referred to as the Sikh Mecca. Justin recording Lao music on the streets of Vientiane. Shooting home made rockets over the Mekong River in Vientiane. These are some of the 2,300 Buddha sculptures at Wat Si Saket in Vientiane, Laos. Vientiane is a wonderful laid back city on the Mekong river. There is a strong French influence here. Laos was a French colony until 1953, except for during WWII when it was occupied by the Japanese. Our first night here we ate a French restaurant: steak (!!!) and eggplant with goat cheese and fancy red wine. Many people in Vientiane speak French and dozens of French expats have opened cafes and boutiques all over town. The city's name used to be "Wieng Chan" which means Sandalwood City, however through French transliteration it became Vientiane. When I (zoe) was here 8 years ago the city looked completely different. It was quieter, dustier and felt kind of empty. Since then it has developed so much and is a booming tourist destination. The New York Times choose Laos as the number one place to visit in 2008. Today we visited a school for Burmese migrant worker's children. The actual school house was destroyed in a storm a few weeks ago. When we arrived the headmaster and students were playing soccer in a large field where the school once stood. The school would cost $6,000 to rebuild but they have no way of raising the money. If you want to donate to their school please let us know. In the soccer field we met a man who had just come from Karen State three days ago. His village had been damaged by the cyclone and there were no signs of relief coming anytime soon. 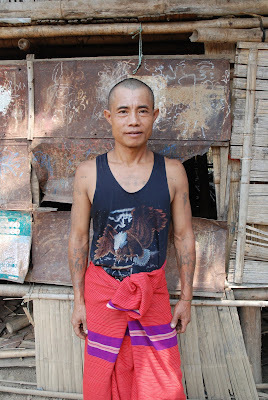 Tomorrow he will travel back to his village in Karen State to assess the damage. When he returns to the Thailand border, our friends will email and tell us what it looks like in there. 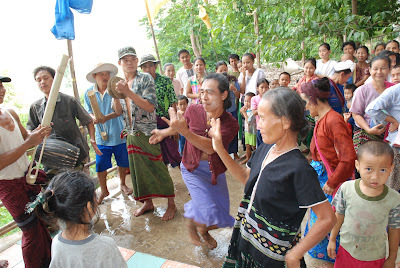 Karen State is the homeland of the ethnic Karen. 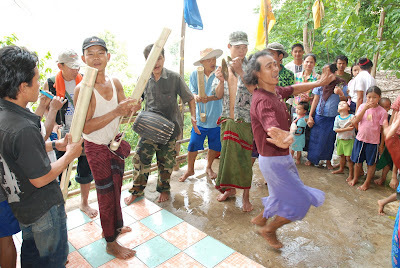 For the last 50 years they have been fighting a bloody civil war against the Burmese military government. The Burma Army has recently escalated its offensive against the Karen civilian population. The latest offensive started in February 2006 and so far an estimated 20,000 people have been forced from their homes and displaced. In the soccer field we met two displaced kids who are also newcomers to the Thai-Burma border. They traveled from Karen State to attend the school. They had made the arduous journey with 23 others. However they traveled dangerous roads and their vehicle toppled over a cliff. Three people died, the rest of the group returned home. The two teenagers were the only ones to make it to Thailand. They are the two boys on the left. We've received lots of concerned emails over the last few days and wanted to let everyone know we're fine. Here in Mae Sot we had a few days of heavy rain but nothing more. Our housemate works at the a local refugee hospital called Dr. Cynthia's Clinic and she hasn't seen any patients yet from the cyclone. She said they might start seeing cyclone victims in a few weeks. Travel is slow in Southeast Burma and it will take people a while to get to the border. As for us, we are just finishing up our project with Karen refugees. 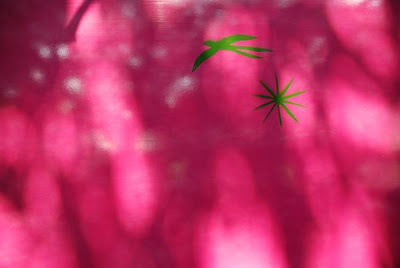 If you get a chance check out: UnseenMaeLa.blogspot.com We're still working out a few kinks. 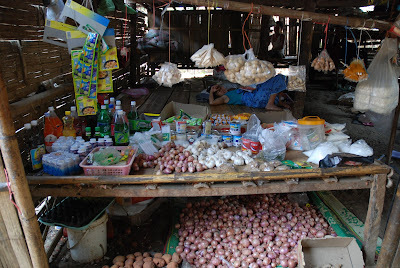 Last week we visited Mae La refugee camp. For the last two months we've been teaching photography to Karen refugees and have heard stories about Mae La. Still, the experience of actually going there was shocking and intense. 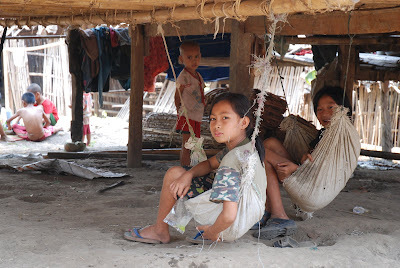 Around 40,000 people live in the Mae La refugee camp. It is surrounded by barbed wire, check points and armed guards. The refugees are not allowed to leave. The first things we noticed was that there were so many children. Many Karen refugees are born and raised in the camps. 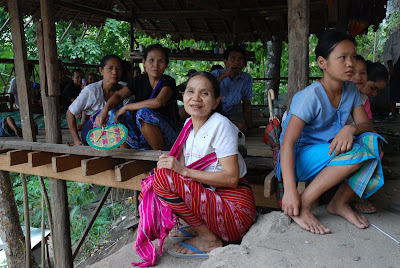 We've met Karen people in thier twenties who lived thier whole lives in refugee camps. We've met many people with homemade tattoos similar to the those on this man's arms. Some of the tattoos are in English and others are in Karen script. There are tattoos for protection, decoration and solidarity. 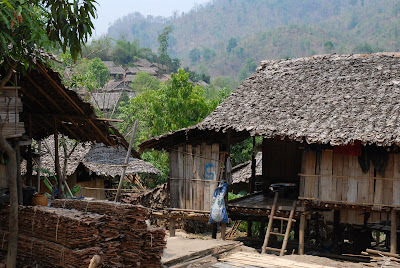 Mae La is the largest of 13 refugee camps on the Thai Burma border. All together the camps house about 150,000 refugees. The United Nations High Commissioner for Refugees expects that about 27,000 people will leave the camps in 2008 and 22,000 in 2009. Many of these refugees will be resettled in the states. 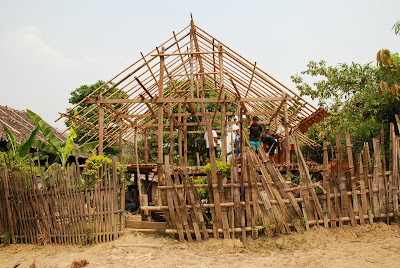 For more info about Karen refugees resetteling in New York check out our friend Karen Zraick's beautiful website: From Burma to New York. We happened to arrive at Mae La for the new year water festival. This festival is celebrated in Burma, Thailand, Laos and Cambodia during April, the hottest time of year. 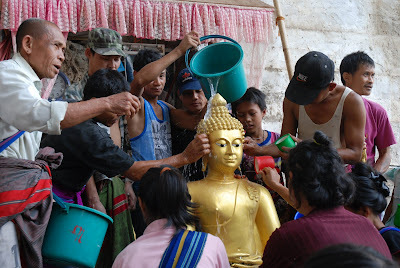 Here people pour water on the Buddha and on each other as a way of showing respect. A group of musicians played traditional songs while people took turns pouring water on the Buddha. Most of the dancers were community elders. Several of these women are wearing traditional Karen clothes. We only visited a small section of Mae La camp. The whole camp is about a square mile and is divided up into three sections (A, B & C). Its huge. There are something like 26 schools, 5 community libraries, 24 Christian churches, 5 Muslim mosques and 4 Buddhist monasteries inside the camp.